This recipe calls for fresh dates and if you have never baked with them before, you can find them in the fresh produce section of the store. They look like an extra large raisin, but are sweeter and much more sticky. When you buy them fresh, you need to store them in the refrigerator. I like to toast the oats and buckwheat groats in the oven before mixing them into the granola (see recipe instructions below). Toasting grains adds a caramelized flavor to them. 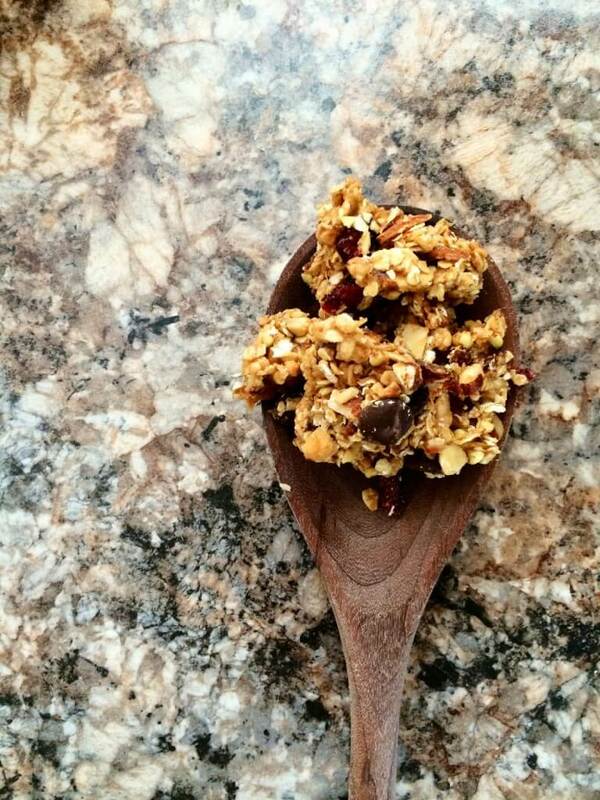 It is easy to do and only takes 10 minutes to make your granola that much better! Bake oats and buckwheat at 350 degrees for 10 minutes, stirring halfway through. When done roasting, set aside to cool. Once cooled, scrape oats and buckwheat into a large bowl. Add almonds, dates, dried cranberries, and peanuts. Heat the peanut butter and honey in a saucepan until warm. Pour peanut butter and honey mixture into the bowl and stir until completely incorporated. If the mixture is dry, add a little more honey. 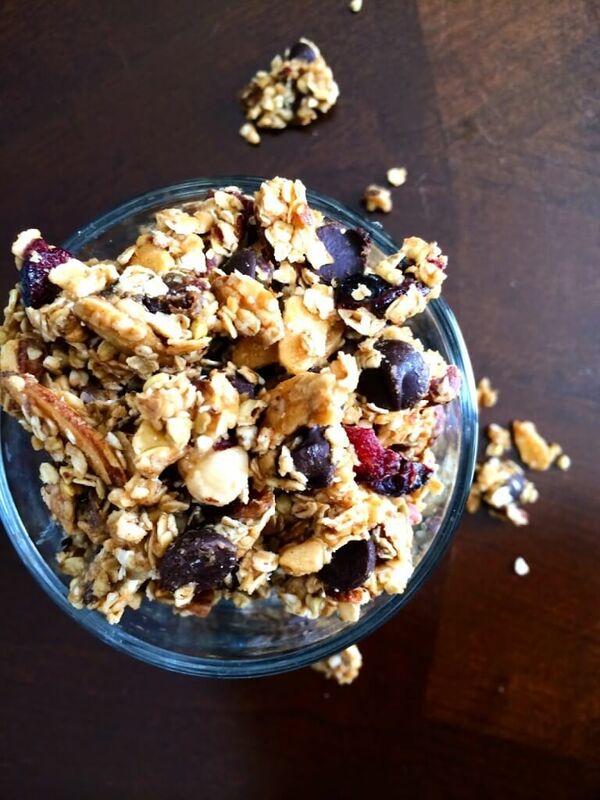 Mix in Chocolate chips, add more than the recipe calls for if you must. 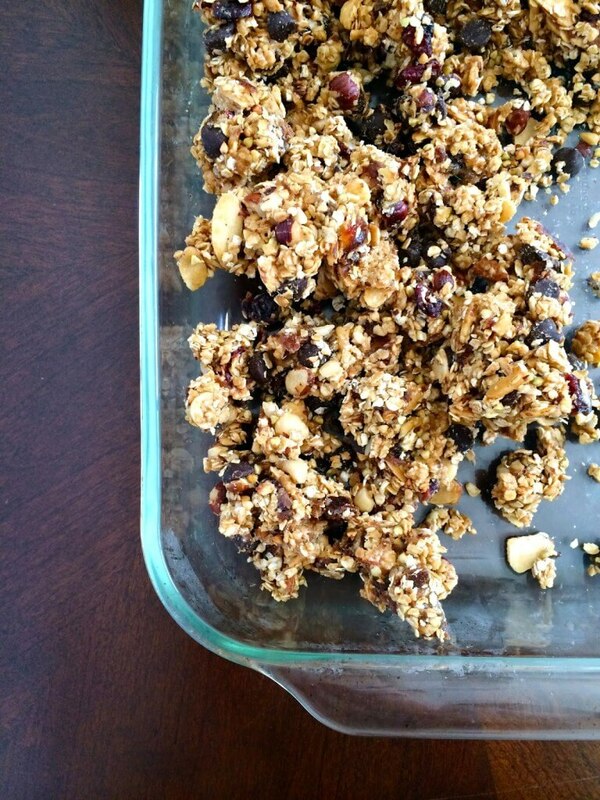 Crumble mixture into a pan or press into a pan if you want to make bars and freeze for 30-40 minutes to set.